Madaket Beach (Nantucket) egg tempera on board painting by Nantucket artist John Austin (1918 - 2000) signed and dated 1975. 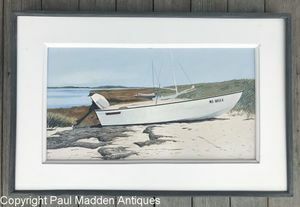 Features a Boston Whaler dinghy on the beach. Original frame. Measures 16-1/2" by 25-1/4" overall.